First the map is initialized from a hard coded list of corner points, then the list of robot drive commands defining the robot path is set up. Next comes the definition of the velocity motion model and the beam model for the perception. The MCL algorithm is implemented in the class MonteCarloLocalization which is initialized next. As implemented it uses 20,000 particles. Finally an instance of the MCLSimulation class is instantiated. It is responsible for handling the drive commands and simulating the sensor measurements. In order to ensure sufficient coverage of the full heading range the robot headings are randomly selected with a granularity of DeltaTheta (0.1 rad). First the move command is applied to each robot 'particle' resulting in new probabilistic robot poses. (The first time Next Step is clicked the move command is set to null. As a result the move step is omitted.) If a robot particle falls outside of the map the particle is removed and a new particle with a completely random pose is added instead. Next a weight for each of the particles is calculated based on how probable it is that the sensors for the given particle yield the simulated 'real' measurements.The individual weights are stored in the m_AggregatedWeights array. In addition the sum of all weigths is built up in the weightsSum variable. 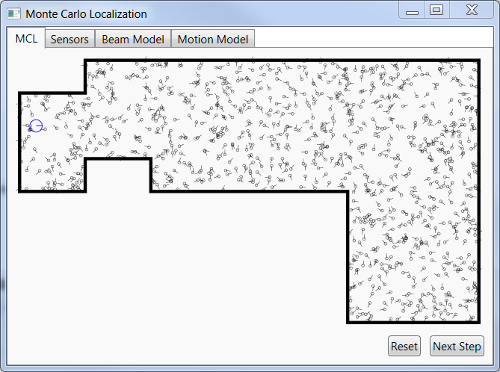 Up to this point the particles still only represent the probability based on the move command. In order to incorporate the sensor measurements we sample with replacement from the available particles based on the weight of each particle. I.e., a particle with a high weight is likely to be drawn (potentially multiple times) while a particle with a much lower weight might not be drawn at all. Essentially it is a Darwinian concept allowing the fittest (the most likely) robot poses to survive while the weaker poses die out. The function DrawParticles picks a random number between zero and the sum of all weights. It then searches for the particle into whose weight bracket the random number falls. If the random number is between zero and the weight of the first particle then the first particle is picked. If the random number falls between the weight of the first particle and the weight of the first particle plus the weight of the second particle then the second particle is chosen; etc. After drawing a complete set of new particles we end up with the same particle count but typically with some poses being represented multiple times. (Note that multiple particles with identical poses almost certainly will result in different poses once the next drive command is applied.) The new set correctly reflects the probability based on the drive command and the sensor measurements. Running the actual application is slightly slower. The runtime performance is significantly impacted by the time it takes to draw the subset of the particles on the canvas. The simulation clearly shows how quickly the MCL algorithm can go from a completely random distribution of poses (start) to a fairly narrow distribution of poses provided the sensors can pick up enough distinguishing structure. This is the case in the left portion of the map and the lower right portion. Also clearly visible is how the once narrow distribution widens up again when the robot drives through the middle part of the map where there is very little structure and some of the robot's sensors don't even reach the walls. This concludes the description of the application. The final section provides download links for the application and the source code. A new article about the Monte Carlo Localization algorithm is now available in the robotics section. Information about ongoing projects will be available on my blog. Detailed information about my Tic Tac Toe playing robotic arm is now available under the Robotics section.